Certified cables will carry labels assuring the consumer that they’ve been tested to meet the HDMI 2.0 spec. One HDMI cable is as good as another, right? Wrong. The old saying “an HDMI cable will either work or it won’t, because digital is all or nothing” is a myth. A poor-quality HDMI cable can deliver a degraded signal, resulting in a snowy picture or worse. A crappy HDMI cable, especially a long one, can also cause problems that you can’t see: radiating enough electromagnetic interference (EMI) to cause problems on your Wi-Fi network. Certified HDMI cables will carry this authentication label. Cables labeled as such will have gone through expanded cable speed tests at an HDMI-authorized testing center to certify that they are capable of delivering bandwidth of 18Gbps, and that they radiate very little EMI. The certification label will have a QR code printed on it that you can scan with your smartphone to verify the cable’s certification status and that it’s not a counterfeit product. The impact on you at home: The certification process and the labels, however, are completely optional, and manufacturers that choose to participate must pay a fee on top of the royalty they pay for the right to use HDMI in their products in the first place. Consumers will be expected to pay that cost—and probably a little more—in exchange for the assurances the certification program provides. 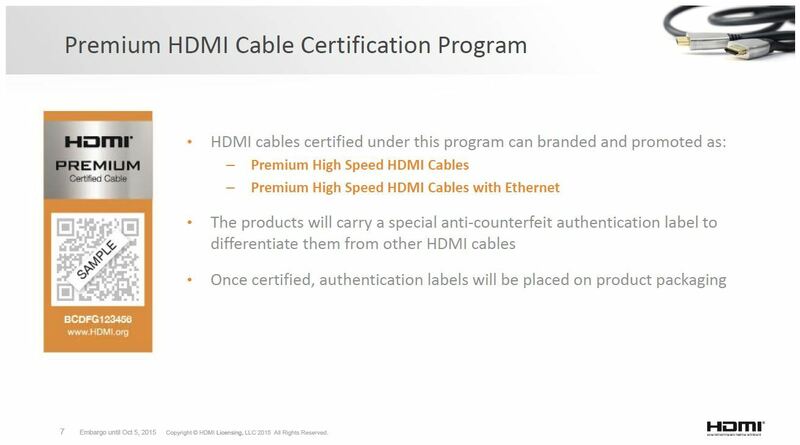 But cables labeled “High Speed HDMI Cable” or “High Speed HDMI Cable with ethernet” (minus the “Premium Certified” and the label with the QR code) should perform just as well—provided they’re made by a legitimate manufacturer. 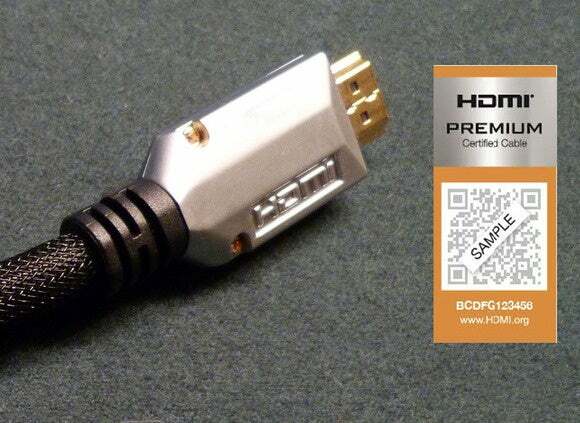 You should be able to find certified Premium HDMI cables in the first quarter of 2016. 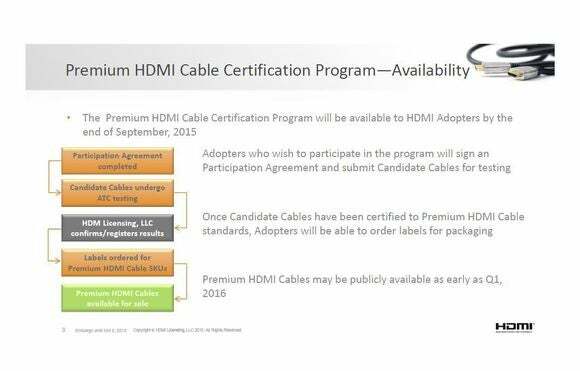 The HDMI Cable Certification Program became available to HDMI adopters at the end of September. 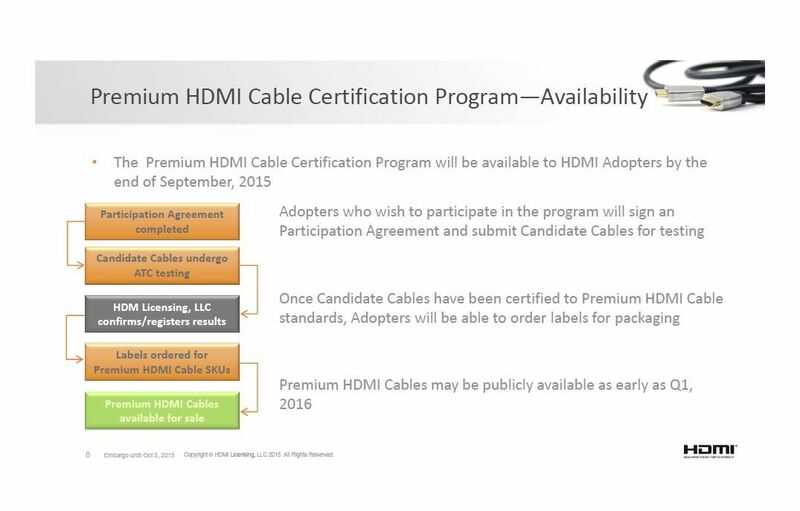 Certified cables should be available in the first quarter of 2016.